Dr. Nasser Mohamed went into medicine to combine his interest in basic science with genuine human connection. 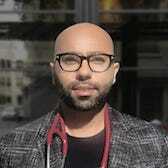 After studying at Cornell in Qatar and completing his residency in Connecticut, he relocated to San Francisco so that he could focus on his areas of interest in men’s and LGBT health. He believes patients can attain better healthcare outcomes with a primary care provider who listens and empathizes with them. Dr. Mohamed also has specialized training in sports medicine and enjoys helping patients from all walks of life address musculoskeletal issues. He enjoys seeing the sense of self-worth and accomplishment in his patients when they are able to push their boundaries.